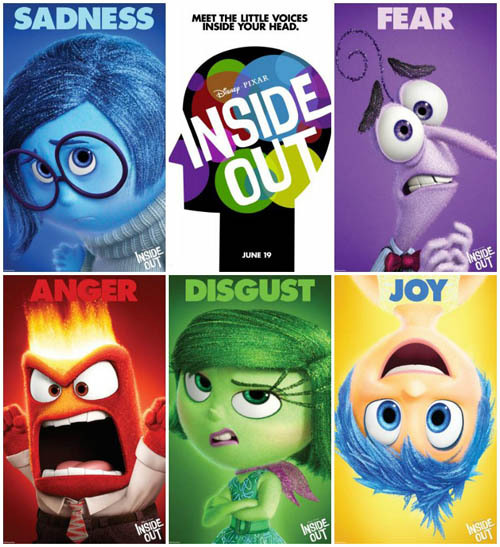 Every review I’ve read about Pixar’s latest feature, Inside Out, has started exactly the same way: “Pixar has been flagging for a few years now, as epitomized by Cars 2, but now they have once again produced something great!” While I hate copycatting what everyone else is saying, I must admit, there is a good deal of truth to that statement. Pixar has been a bit off their game, though I’ve generally liked, if not loved, their work anyway, and, yes, Inside Out is a definite step back up towards their usual caliber of movie. So, my question: is Inside Out really all that great without comparing it to the other good and bad Pixar movies? The basic premise, as revealed in the trailers, is showing us a dramatized version of our emotions. Within the character of a young girl, Riley, are five emotions – Joy, Sadness, Fear, Anger, and Disgust – who walk, talk, and interact with each other. They pilot Riley from within her brain’s headquarters, watching over her and the memories she collects. Most of these memories are small, everyday events, and a few select events are pivotal “Core Memories,” which are the foundation of her personality, each one representing something she values. Now, here’s where things get really interesting: thus far, all of the Core Memories have come from moments when Joy was in control. So what happens when, for the first time, a Core Memory comes from a moment of Sadness? Joy flips out, trying to stop it, throw it out, keep it from influencing Riley… and that is when everything starts to go wrong. Rapidly, terribly wrong. As it happens, Riley is going through something difficult, and yet she’s been happy and upbeat, very brave and supportive of her parents. Her mother meant to show appreciation for that effort, but accidentally pressured her to stay happy, never shedding a tear. Now isn’t that an interesting detail? Most of this movie shows how our emotions influence us, but, more subtly, it also shows how we can influence our emotions, too. In Riley’s case, she is trying too hard to be happy, snuffing out Sadness, as Joy tries to, and as a result she’s very unhappy, lashing out under the influence of Fear, Anger, and Disgust. But Sadness has its rightful place, including allowing us to endure our pain, reach out for the support we need as human beings, and also to empathize with and support others in their own respective agonies. Joy is the one who has to realize this, and how wrong she’s treated her friend Sadness, a wrong choice which has repeatedly landed her in a series of dire situations, each one more desperate than the last. Which, of course, means Riley’s situation, and her choices, are growing worse and worse as well. Until Joy (and Riley) let Sadness have the controls for awhile, her pain just grows and threatens to do her serious harm. Only when she lets her grief out, speaking honestly with her parents and letting them support her, can she finally be free of her burden. In the tearful catharsis, she’s able to smile again… to feel sweet, happy Joy. We can learn a great deal about ourselves and our relationships from this movie. I believe it’s going to do a lot of people a lot of good to watch it. And Inside Out manages to make us laugh all throughout this inner journey. Oh, and cry. Joy and sadness, hand in hand, every step of the way. All in all, I enjoyed the message, the themes, the characters, the plot, the setting, the jokes… yeah, Inside Out is a pretty good movie for the whole family to enjoy! 🙂 I’m sort of on the fence about calling it “great,” but leaning in that direction. Rating: I’m giving this one 9 stars out of 10. This entry was posted in Movies, Tuesday Review and tagged Inside Out, Pixar, Pixar movies. Bookmark the permalink.